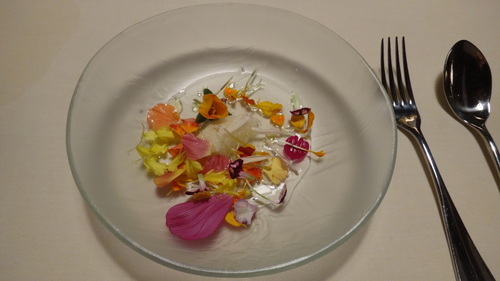 New project on Molecular gastronomy, Neuroscience, and Digital Smell. 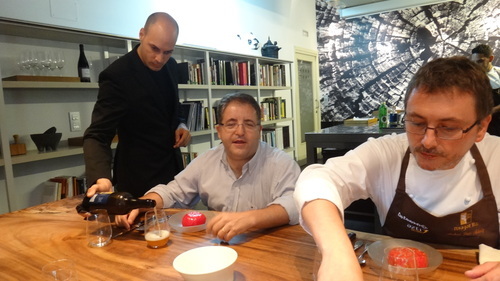 The Second Project Meeting at Mugaritz with Chef Andoni the Top 3 Chef in the World and Luis Castellanos famous Spanish Neuroscientist. We are collaborating with Koki Tsubouchi of Chatperf in Japan also. Post by Adrian David Cheok. I had the great pleasure to be invited to a meeting with Andoni Luis Aduriz, Number 3 chef in the world and Luis Castellanos CEO of Jardin de Junio. They wanted me to present our work in digital augmented taste and smell. 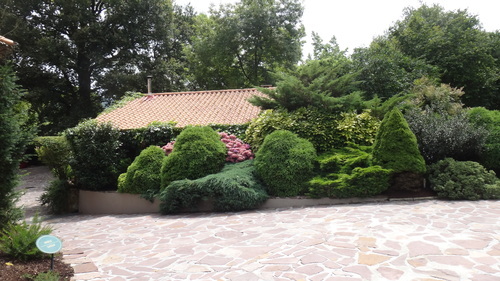 The restaurant is in a beautiful mountainous area around San Sebastián. At first we had lunch and discussions together. The lunch was simple yet so delicious. Tomato with olive oil and salt, baby lettuce, and lamb chops. I didn’t realize the lettuce was a sneak preview of the incredible dinner. Next I gave a presentation on our research on multi-sensory mixed reality and I gave some demonstrations, such as the electric taste machine. 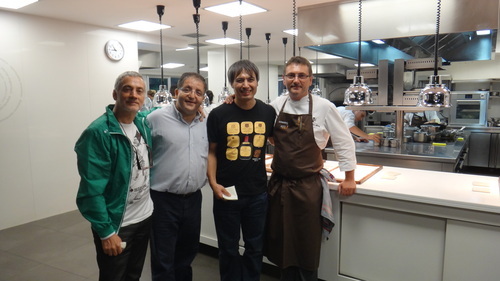 I was really happy and excited that Chef Andoni was pleased and wants to work together on a project. Next we watched a piano concert at the restaurant, and at next the most amazing dinner of my life. 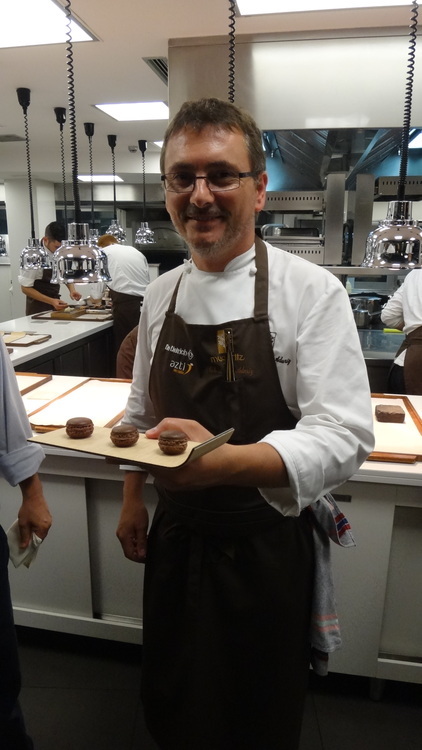 Andoni gave us a tour of the kitchens. It was incredible to see more than 70 staff prepare the dishes for only a small group of patrons, maybe 40 or 50. Each table at the dinner is given different dishes, to suit the mood and personality of the patrons. It is an individualized feast. There were more than 20 courses at the dinner. It was an explosion of amazing tastes, textures, visions. 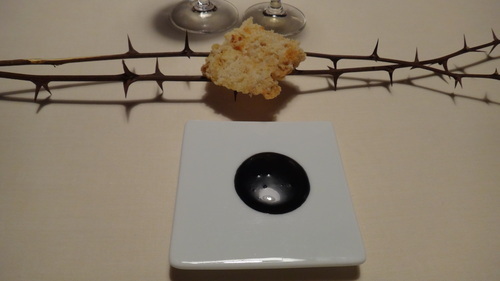 The dishes were an incredible combination of traditional and modernist / molecular cuisine. For example what I thought were noodles were made from some kind of beef marrow. What looked like a chocolate sweet was made from duck’s blood. At first my brain forced me to think it was chocolate, because of the visual dominance, and next I could taste savory. The whole dinner went on for hours and hours, accompanied by incredible local wines also. At the end of the night we were saturated and exhausted. It was one of the most incredible times of my life. Professor Adrian Cheok of Keio University’s Mixed Reality Lab has been a pioneer in blending the internet and the physical world, producing creations like Petimo, which allows kids to send hugs to each other over the internet; and Huggy Pajama, a similar solution for kids whose parent might be away. Projects from Mixed Reality Lab emphasize the importance of physical touch in a world where communication is drifting away from that particular sense. Professor Cheok now has a new project in the works that iterates on this philosophy of blending physical touch with the internet. The RingU is another device that transmits these internet hugs, but it does so in a far more compact device. Using a ring connected to your smartphone by Bluetooth, signals can be sent to a paired ring over the internet. You can see a quick overview of RingU in the video below. When you want to communicate a sort of virtual hug to your partner — and it could be a family member, a lover, or just a good friend — you squeese the ring, and your partner will receive this ‘tele-hug’ in real time. So even when separated by huge distances, you know that a person far away is thinking of you at that very moment. There are even different types of hugs which you can send — mini, intense, and urgent — depending on the situation. 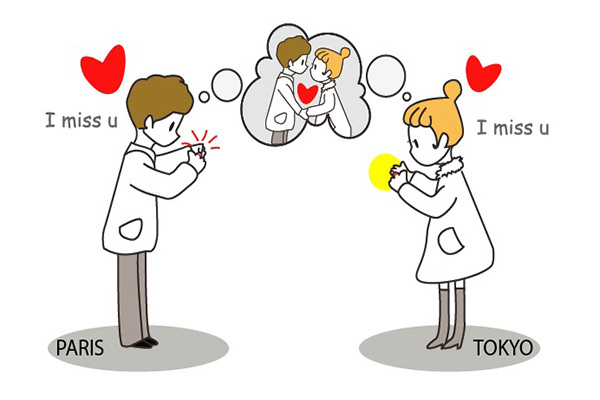 You can also control the color of your partner’s ring according to whatever emotion you’re feeling at the time. There’s also the accompanying mobile app which partners can use as a private social network to share messages, photos, videos, thus complementing your physical hugs with the other types of communication you’ve become used to in this mobile age. 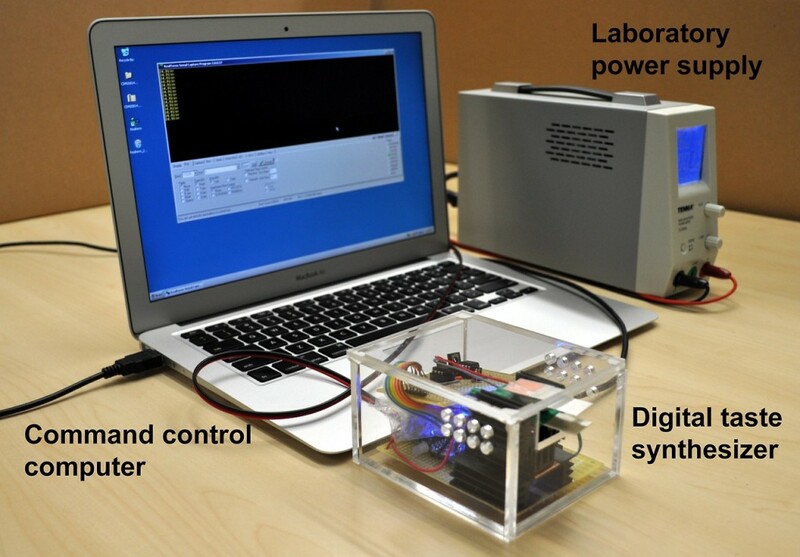 Latest version our Electric Taste Machine system by Nimesha Ranasinghe, Keio-NUS CUTE Center. Our project “RingU” is on Camp-Fire! (Japanese version of Kickstarter). Please support our project on Campfire. We appreciate any support no matter how big or small. World’s first tele-hug ring: With RingU you can give your boyfriend, girlfriend, or best friend a remote hug no matter how far you are from each other. Paper, as a traditional material for art and communication, shows great potential as a medium for organic user interfaces, with its ubiquity and flexibility. However, controlling and powering the sensors and actuators that enable interactive paper-crafts has not been fully explored. We present a method of selective inductive power transmission (SIPT) to support interactive paper-crafts. 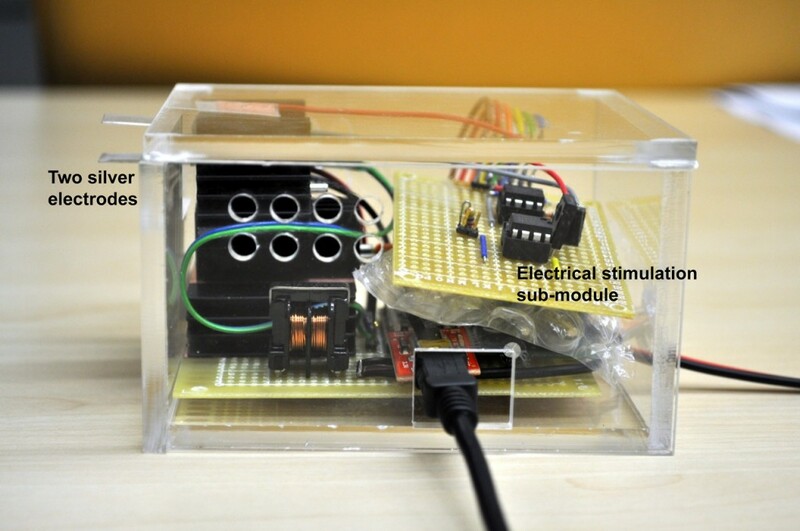 The novelty of this method is that the power transmitter can be controlled to selectively activate one specific receiver at a time through inductive power transferring with multiple receivers. This was achieved by changing the output frequency of the power transmitter to match the impedance of the receivers. The receivers could be embedded or printed to drive paper-crafts. Based on inductor–capacitor oscillating circuit and a function generator with a power amplifier, we developed two different prototypes of SIPT. By comparing the performance of both prototypes, we discussed the advantages and disadvantages of the two systems, and their applications in different contexts of paper-crafts. In addition, we proposed the instructions for using SIPT in developing interactive paper-crafts. With this technology and instructions, we hope to facilitate users to easily design new types of paper-craft systems without being concerned about the arrangement of wire connections to power supply on a massive scale. In this paper, we present a synergy of technology and traditional craft made possible with AmbiKraf Byobu. AmbiKraf is a non-emissive, color-changing fabric technology that allows subtle animations on fabrics. Byobu is a traditional Japanese room-divider screen, usually painted by artisans and crafts people. We first discuss the organic qualities of AmbiKraf technology that particularly lend itself to traditional art and craft practice. These qualities include the animation of ambient, non-intrusive and calming motifs using non-emissive display characteristics. We then discuss in detail how AmbiKraf technology is implemented and paired with the art form of Byobu. Interaction with the system is also briefly touched upon, as well as discussion regarding the cultural implications and mutual benefit of combining technology with traditional craft. Through the use of AmbiKraf technology embodied by the Byobu, we hope to provide a convincing example that sensitively combines traditional textile crafts with new technology in order to help redefine the meaning and role of traditional textiles. T Jacket usage scenario from Wei Liang on Vimeo. My graduate Ph.D student James Teh’s new company, T.Ware, an interactive computer hugging jacket for children. 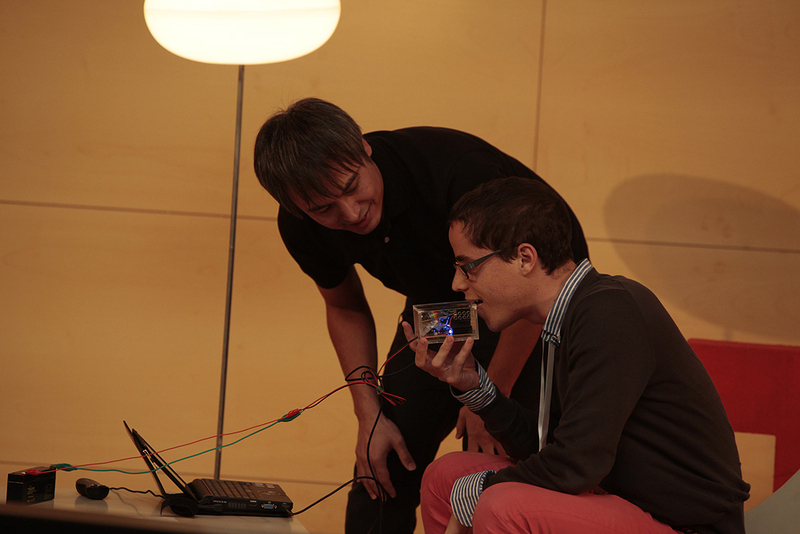 IBM predicts smell interfaces with computers as one of the important upcoming technology innovations. I made a reading list for my Master and Ph.D students in the area of empathy and experience communication. Do you have more suggestions? If so please feedback. 26 days ago – Family life is complex and dynamic. It forms a core part of our existence. It’s neat to feel the heat: how can we hold hands at a distance? How do couples use CheekTouch over phone calls? 163 days ago – Photographic mementos are important signifiers of our personal memories. Read on for advice on using social media tools for research, from an interview with Prof. Adrian David Cheok, a Full Professor at Keio University, Graduate School of Media Design. We live in a hyperconnected society and can access limitless information in real time and that’s fundamentally changing the way we do research. Before we would wait until a journal paper was published or for an annual conference before we would see each other’s work. 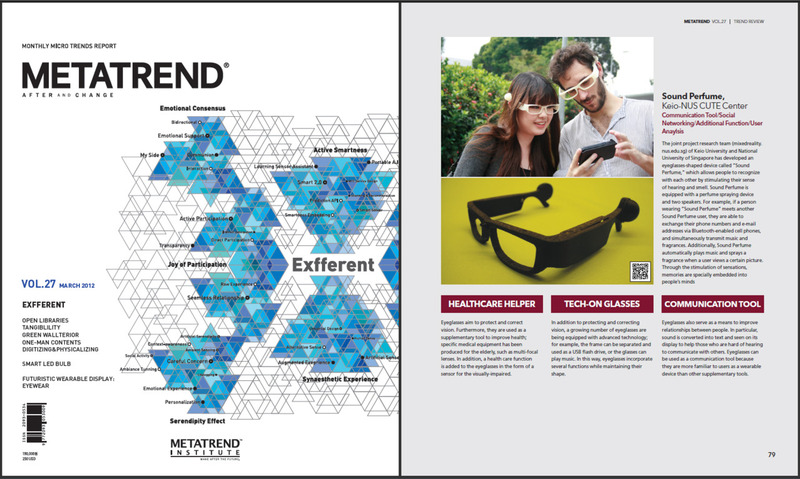 Now you can keep abreast of the latest research through social networks. The hyperconnectivity of social networks also offers a new way of building up your academic network. In academia, just like in any other profession, it’s very important to build up your network, to have sponsors or mentors in your career, especially when you’re young. Now you can do this virtually: You don’t have to be in the same university or attend the same conference as these sponsors or mentors. Of course, some physical interaction is important. But you can build a very strong academic network using these new social networks and new connectivity. You may still need to send your CV but that’s just the starting point. People like to check your publication profile on different digital libraries and on Google Scholar and other social profiles. People are going to see what you say on your blog and your Facebook profile. So it’s very important that you take control of this as a young researcher, and always keep an eye on that and make sure you are optimizing your research, that you appear well on these profiles and social networks. All the profiles have slightly different characteristics. It is important to build up your LinkedIn profile because potential employers look at this. Twitter is a way of engaging with fellow researchers and the general public in real time. Facebook is kind of a connector – you can use it to connect to other academics, and be aware of upcoming conferences. And this is a core network that you use to supplement the others. Young researchers are advised to have a profile on all of these networks and to choose one as the main projection of their research. You should still publish in top journal papers. And you should still try to get into conferences. But in between the papers and the conferences, you should post about your research findings and your ideas. A lot of the big difficult problems that we’re facing in research really need collaboration, and often you can get real-time feedback on your research by using social networks. Stay focused. Normally people like to read your blog, or follow your Twitter or Facebook when you stay focused on a particular topic. You become well known in a particular field. No matter at what stage you are in your PhD, you can build up your expertise and people will want to hear what you have to say about your field. Whenever you send a Twitter message or post something, ask yourself “Will this be read by other people?” Unless someone knows you well, they’re not interested in personal things that go on in your life, so I suggest staying focused on professional things. It’s okay sometimes to post funny things and bits of humor to engage with people. But mainly stay focused on a certain topic – your research – and get well known for that.